Did Michael Vick seriously consider leaving football to take a swing at Major League Baseball? Larry Bowles turned on his personal computer, dialed up the internet and anxiously awaited the moment his life would change. It was June 6, 2000, which marked the start of Major League Baseball’s annual first-year player draft, and Bowles was eligible to be selected after three years as a left-handed pitcher at Virginia Tech. So from the bulky machine in his apartment bedroom, he listened intently to the three-minute, tape-delayed “live” broadcast. Five hours and 10 rounds came and went as the first day of the draft drew to a close. Day 2 slugged along, from Round 15 to 20, to 25 and beyond. Eventually, Bowles heard a familiar name — but it wasn’t his. Instead it belonged to another left-handed athlete from his school. He can clearly recite the cadence of that 30th-round announcement from memory. The Colorado Rockies select Michael Vick, outfielder from the Virginia Polytechnic Institute and State University in Blacksburg, Virginia. 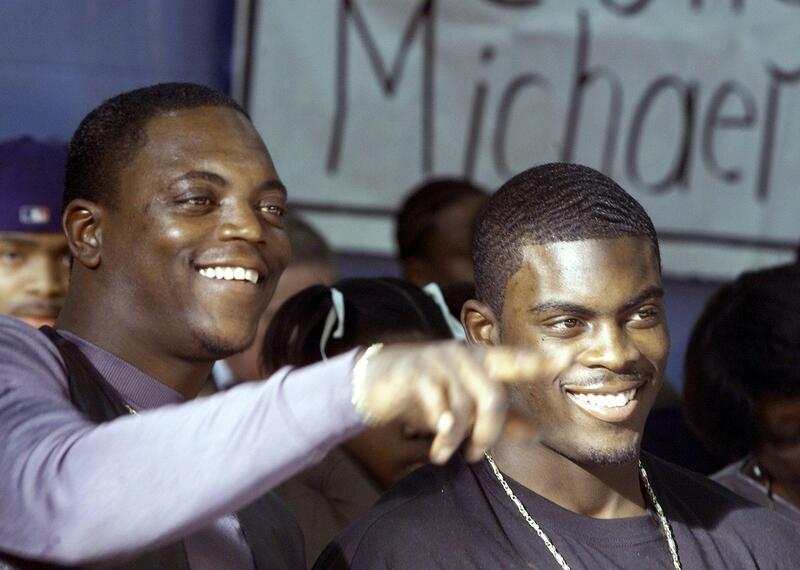 Virginia Tech quarterback Michael Vick (right) and his father, Michael Boddie (left), acknowledge a friend in the audience during a news conference Jan. 11, 2001, in Newport News, Virginia, where Vick announced his intention to leave school for the upcoming NFL draft. Just one year before, Vick was also offered a spot in the MLB as part of the Colorado Rockies. Those physical gifts, along with some wishful thinking, led the Rockies to roll the dice on Vick with the 887th overall pick in the 2000 draft. He was taken just eight slots after four-time All-Star second baseman Ian Kinsler, and seven after future Gold Glove and Silver Slugger Award-winning first baseman Adam LaRoche. One of Colorado’s local scouts, Jay Matthews, tracked down Vick’s number, and members of the Rockies’ front office called Vick to deliver the news just as he was walking into a weight room. Vick’s childhood hero is the lone player in history to play in both a Super Bowl and World Series, as well as the only one to suit up for both an NFL and MLB game in the same day. Sanders, who played nine seasons in the majors for the Yankees, Braves, Reds and Giants, was selected twice in the MLB draft: the first time in 1985 by the Kansas City Royals in the sixth round and again in 1988 by the Yankees in the same round, the 30th, in which Vick would ultimately be chosen 12 years later. “I wasn’t expecting to hear Mike’s name,” recalled Bowles. “I actually left the room to tell some of my teammates he’d been picked by Colorado. I came back and heard my name.” Three selections after Vick, the Anaheim Angels drafted Bowles, making them the only two picks from Virginia Tech that year. “I’m still a little upset that he went ahead of me,” Bowles said with a laugh. He’d soon decide to chase his dream of playing in the big leagues. But Vick had a choice to make. “Michael hadn’t played in a long time, but we took a shot and really had nothing to lose,” Rockies vice president of scouting Bill Schmidt said before an early July game. He handed the phone over to Danny Montgomery, a longtime special assistant to the ballclub’s general manager position. Almost two decades ago, he was the biggest advocate of drafting Vick. “The athleticism with that kid … man,” Montgomery said of Vick’s 1999 season, in which he finished third in Heisman Trophy voting as the nation’s leader in passer efficiency while leading the Hokies to the national championship game as a redshirt freshman during his first season starting. No previous contact had been made between the Rockies and Virginia Tech’s quarterback before Vick got the call on draft day, so Colorado’s decision was unexpected but not an anomaly. The selection of elite high school and college football players has become a commonly practiced tradition in Major League Baseball since the first amateur draft in 1965. Countless athletes who’ve gone on to make it in the NFL have previously been drafted by MLB teams. And most organizations are attracted to one particular position on the gridiron. Yet, as history has proven, elite college quarterbacks will choose the NFL over MLB more often than not. However, that doesn’t mean they won’t listen to what pro baseball teams have to say. Ten days after the 2000 draft, Vick and his mother, Brenda, agreed to meet with Rockies officials in Newport News. Vick welcomed the Rockies’ Montgomery and Matthews into his family’s three-bedroom apartment in the Ridley Circle housing project. 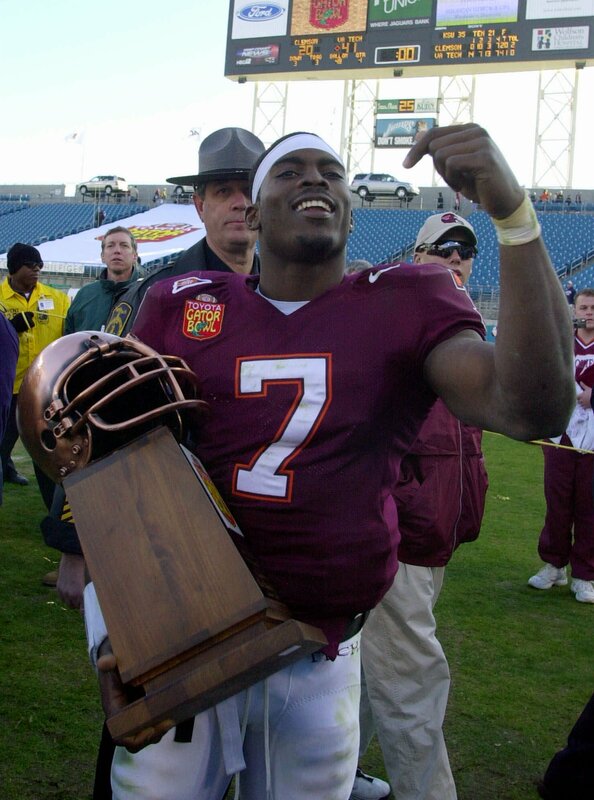 Virginia Tech quarterback Michael Vick holds up the MVP trophy after his team defeated the Clemson Tigers 41-20 to win the Gator Bowl in Jacksonville, Florida, Jan. 1, 2001. “The most important thing to consider is, where’s the kid’s passion?” Schmidt said. “Mike’s was in football, and we figured that. But sometimes you don’t know until you ask.” Vick welcomed the Rockies’ Montgomery and Matthews into his family’s three-bedroom apartment in the Ridley Circle housing project. Sitting across from him, Colorado’s assistant general manager and scout shared a straightforward pitch to the 1999 Big East Rookie and Offensive Player of the Year, headed into his final season before gaining NFL draft eligibility. Per NCAA rules, Vick could’ve played summer ball in the minors for the Rockies and still maintained his college football eligibility. Colorado even had a Class A affiliate, the Salem Avalanche, located approximately 30 miles from Virginia Tech’s Blacksburg campus, where Vick had to report for training camp on Aug. 4, 2000, ahead of the upcoming season. “I was thinking maybe we could get him to Salem,” Montgomery said. “Not necessarily put him on the field, but put him in a uniform.” And if he did one day crack a minor league lineup? Members of the organization were crystal clear on where they envisioned Vick, who’d both pitched and roamed the outfield as a middle schooler, would fit in. “We would’ve played him in the outfield,” Schmidt said matter-of-factly. Vick declared for the NFL draft at the end of his redshirt sophomore season — which he capped off by being named MVP of the 2001 Gator Bowl. Nearly four months later, the Atlanta Falcons selected Vick with the top overall pick in the NFL draft, making him the first African-American quarterback to go No. 1. The six-year, $62 million contract he’d sign with the Falcons also made history as the richest rookie deal the league had ever seen at the time. Beamer was right. But in an alternate universe, could Vick have really played for an MLB team? Sanders and Bo Jackson, the only athlete in history to be named an All-Star in both baseball and football, did. Michael Jordan even came close. So why not Vick? Schmidt vowed to stay in touch with Vick too. But the two have never met, and they only spoke on the phone once, when Colorado drafted him as a project in 2000. The supreme athleticism that the ballclub admired deeply allowed him to revolutionize the game of football from the quarterback position. But the Rockies hoped to see the day that Vick could show off that speed and arm on a baseball diamond.